relief management across the country. One of the most recent examples of the crucial role played by Indian Railways is the way it helped deal with Tripura’s fuel crisis situation. For the first time in the history of North-East India, Indian Railways recently started a RoRo (Roll On Roll Off) service to transport fuel to the state. The need arose after petrol prices skyrocketed to levels of over Rs 300 per litre. Not just petrol, diesel prices had hit Rs 150 per litre and cooking gas was also very costly. Kilometre long lines at petrol pumps were common sights in the state. The situation was a result of road connectivity to Tripura being severely affected due to rains. 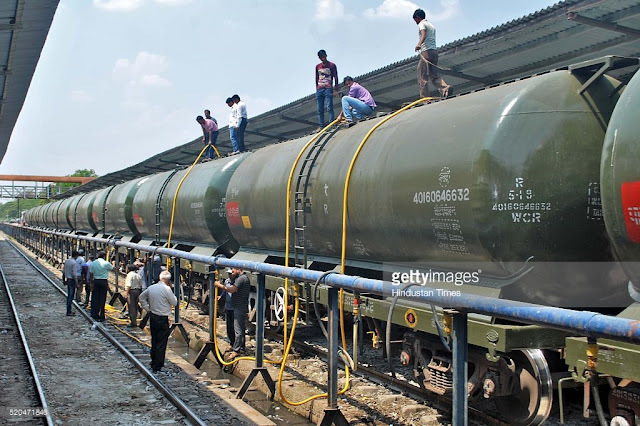 At this juncture, to reduce the demand-supply gap, Railways sent flat-wagon goods train with loaded tanker trucks from Assam to Churaibari in Tripura. PranavJyoti Sharma, Chief Public Relations Officer at North-East Frontier Railway told FE Online, “Earlier railway connectivity to North-East was a big problem, but now with Tripura being connected, Indian Railways has been able to provide timely aid to solve the crisis.” “IOC has given 2 lakh 36 thousand litres of HSD (High-Speed Diesel), 7*12 metric tonnes of LPG, 12,000 litres of motor spirit (petrol) and 48,000 litres of SKO (Superior Kerosene Oil),” he said when the first train was rolled out.